Here's a great set of photos - disassembled appliances - from Brittny Badger, who just graduated from the Hartford Art School with a BFA in photography and a minor in visual communication design. The National Science Foundation (NSF) has a great resource on the Internet called NSF and the Birth of the Internet. 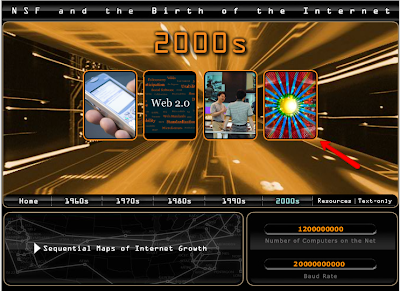 It's a really well done online resource that traces the evolution of the Internet from the 1960s to today and beyond - using text, video, and interactive media. To put in perspective what has happened in these 40 years, consider that in 1969 there were 4 computers on the net and the baud rate was 4 kilo bits per second - map below. In 2007, we're looking at 120 billion computers on the net and a baud rate of 20 Giga bits per second. Where are we going? NSF has a great video describing this vision as well. One really interesting comment comes from Doug Gale, a former NSF program officer and CIO of the University of Nebraska, when he was asked, in 1987, by his school chancellor when he could stop writing the big checks to build out the network. Gale's reply: "... the bandwidth of the human eye is about 10 gigabit ... anything less than that is an insult to me as a human being ... until we've got a 10 gigabit connection to every individual on the campus, I'm going to have to keep building the network." Well we're nearly there and the appetite for bandwidth has not even begun to subside. Another great resource is Gordon Snyder's Happy 20th Birthday to the Modern Internet. A college, a flash drive, Social Security numbers, and a contractor … all the familiar ingredients for a security fiasco. And yes, the blog Educational Security Incidents is reporting that Arapahoe Community College has put 15,000 current and former students at risk for identity theft because a flash drive with their names, addresses, credit-card information, and Social Security numbers was lost in early August. Here's a flickr slideshow of some photos I took with my iPhone. What you're seeing in the slideshow is the result of a group of faculty discussing revisions to our networking program. Our tools? A whiteboard, dry erase markers, an eraser (not sure we used it), and a variety of post-it notes. This was the most productive group collaboration session I've had in a long time. Rather than sitting around a conference table and discussing things, we were up and active; hashing-out disagreements, moving around post-its - even thrashing post-its. This was a great way of working and I think our program and our students will benefit from the work we did. What's better is I used my iPhone to capture all the notes and develop the documentation for our proposed revisions. So next time you're working with a team consider going low-tech. You might be surprised by the results. Charles Wankel is gathering hundreds of co-authors from around the world to write his latest textbook — 926 of them in 90 countries, to be exact. Mr. Wankel is an associate professor of management at St. John’s University, in New York. Each of his co-authors, most of whom are also management professors, will write or edit a small portion of the final text, which is slated to be published by Routledge. They’re organizing the vast effort using a wiki that lets participants see and edit each other’s contributions. Mr. Wankel is essentially asking the expected audience for the book to be part of its production, since he hopes that management professors around the world will end up using the text in their courses. He found his co-authors by searching social networks like Facebook and LinkedIn for members who were management professors — and of course he invited colleagues he had met over the years. The practice has been called “crowdsourcing,” a term coined by a Wired magazine writer to describe outsourcing a project to a large group using collaborative Internet technologies. The authors are practicing what they teach, too: The book’s title is Management Through Collaboration: Teaming in a Networked World. The idea is that this book will be produced using an immense network of coauthors. The chapters will present text, examples, and exercises using networking in a globalized world as a prism through which the key management functions are refracted in telling, useful and important ways. This introductory management textbook is using a new authoring structure to create a high quality, cutting-edge, and well-researched book. The coauthors of this breakthrough endeavor number almost a thousand management educators and researchers in about ninety nations. The twenty-first century global virtual community creating this work is itself an interesting constellation of management phenomena that provides a wide range of exciting management experiences for its members to use as examples in their teaching and writing. More importantly, being part of such a diverse, constantly self-creating, mob of innovators is immense fun! It is our hope that our contributions from Tonga to Peru, from Iceland to Botswana, from Hawaii to Tunisia, from China to Grenada, will reflect our diversity and yet our communality in this increasingly connected world in ways that will engage and excite learners in all the nations of the world. Image via Wikipedia This video [via Communication Nation] answers the question - "What if there were no stop signs and a major corporation was charged with inventing one?" Very funny! Ahoy, Ahoy: Happy Birthday to - Hello? Interesting story from wired magazine, detailing the first use of the word hello to initiate a phone conversation. Really scary that Bell proposed using "ahoy, ahoy." Try for a week not using the word hello and instead ahoy. Edison's contribution to the "improvement in telegraphy" was giving us the salutation now used the world over, in one form or another. Bell's famous first words spoken over what we now call the telephone -- "Mr. Watson, come here. I want to see you." -- were delivered without any greeting at all. The Library of Congress has been working to digitize their collection of photos and make them publicly available on popular photo-sharing site flickr. I've subscribed to their feed on flickr, so I get notified in my feed reader anytime the LOC adds new photos. 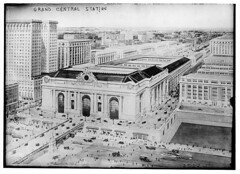 Here's a great shot of Grand Central Station taken between 1910 and 1915. This is an old video, which has been floating around the Internet for years. M. J. McDermott gives a really provocative presentation comparing traditional mathematical reasoning techniques to newer methods being promoted in some schools. I'm not sure that Singapore Math is the answer, as McDermott suggests, but I began to wonder myself, when my daughter asked with help with Stem and Leaf Plots - something that, as an engineer, I had never heard of. Do you remember the old "Be Like Mike" commercials featuring Michael Jordon? Those commercial - I'm not even sure what the product was - were succesful because Michael Jordon was the best in his profession. The lesson, I think, is that when you want to be the best at what you do, model your behavior on the best in your field. We can't be Michael Jordon, but maybe we can be like Mike. In education, you could pick any number of schools, but for now let's consider Stanford. I must admit I'm jealous of schools like Stanford for their enviable location. Forgetting for a moment the weather, consider how many dynamic, technology-rich companies there are in the Palo Alto area. With that much innovation in the region, it's not surprising that Stanford would be driven to innovate as well. It's not just that you have access to the brain-power and the demand for new courses and programs, you also have to have the institutional infrastructure and support to be able to quickly develop these courses and roll them out. Someone - maybe everyone - at Stanford realizes the importance of being able to react quickly to market needs and demands - much more quickly than the typical glacial pace of the academic approval process. Maybe we can't be Stanford, but we can "Be Like Stanford!" If you have Tuesday and Thursday afternoons free you might want to sign up! Fans of Apple gadgets have been happily blogging about a listing in Stanford University’s course catalog for the fall that includes what might be the first college course on programming for the iPhone. The course is listed as being taught by “Marcos,” and the word is that the professor will be Paul Marcos, a long-time Apple employee. Officials for Stanford’s computer-science department could not be reached for comment. Stanford has been quick to offer courses on new technology in the past. Last year it offered a course on programming applications for Facebook, which became a huge hit. From the Journal of Interactive Online Learning, here's a really interesting study written by Elizabeth Rowe and Jodi Asbell-Clarke from TERC . TERC is a not-for-profit education research and development organization focused on improving math and science education from pre-kindergarten through college. It's one of the few fairly comprehensive studies of its' kind that I've seen. High levels of course supports, meaning scaffolding within the materials to help students understand and link concepts, were important for student’s mastery of content and quality of participation in online discussions. High levels of instructor support were related to higher grades but lower mastery and quality of discussion. Students in courses with high frequency of hands-on and minds-on activities tended to get lower grades, while those in courses with high frequency of pen and paper activities tended to get higher grades. Some overall implications of these findings for developers include the importance of course design for students’ success. Courses with supportive structures in place through materials presented opportunities for student achievement, even when there was less instructor support. This suggests that the role of the instructor shifts in online learning to one who must pre-design the course with the student in mind, but then fade the interaction and let students play a significant role in their own learning, including choosing relevant discussion topics. Really interesting finding that is sort of counter-intuitive, making the case for greater faculty involvement in course design and less online interaction. Most faculty I know that teach online feel obligated to be in their courses constantly, interacting, starting and jump-starting discussions, prodding students and really being as much a presence online as they are in a traditional classroom. I like the point made that instructors need to "... fade the interaction and let students play a significant role in their own learning, including choosing relevant discussion topics." Giving up control - not an easy thing to do. Download the full article here. a small cellular base station, typically designed for use in residential or small business environments. It connects to the service provider’s network via broadband (such as DSL or cable); current designs typically support 2 to 5 mobile phones in a residential setting. A femtocell allows service providers to extend service coverage indoors, especially where access would otherwise be limited or unavailable. The long-awaited CDMA femtocell (once dubbed the Samsung Ubicell) essentially acts as a super in-house signal booster, or, if you'd prefer, a mini Sprint tower sitting right beside your router. If the concept is ringing a bell, it's because you've certainly seen a similar setup with T-Mobile's @Home service. So, the real question here is can the AIRAVE really help your reception? And more importantly, is it worth the extra coin? Read on to find out. The box itself is no bigger than most home routers, it's lightweight, and it can be stored horizontally or vertically. 'Round back, you'll find an Ethernet jack, a GPS socket, an AC connector and an On / Off switch. After running overnight, the device was still rather cool to the touch, so there's no worry of it melting anything that's sure to sandwich it in your already cramped desk. And yeah, about that GPS port. Much to our dismay, the AIRAVE requires that a GPS lock is found before it begins operating, and it requires that said lock puts you within the United States of America. Furthermore, Sprint claims that this unit is all ready to support multiple callers, and while that is indeed true, the actual bandwidth requirements are a touch harder to come by. For a single call, you need at least 40Kbps up and down in order to not break up, while 2 callers needs twice that and 3 callers thrice. If a fourth or fifth caller attempts to tap into the AIRAVE while a trio of calls are already underway, those mobiles will be directed to the nearest cell tower. Should one of the original three hang up, however, the "next in line" will hop onto the vacant AIRAVE slot. We tested the unit in a home with notoriously awful Sprint coverage -- we're talking 0 to 1 bars, flashing in and out of roaming / Sprint service depending on how the wind blows. We used a certain Sprint handset in this domicile for a solid month and dropped countless calls and could barely hear when connected unless we waltzed over to "that spot by the window" and remained there for the duration of the conversation. our signal strength indicator shot up from 1 bar to 5 bars immediately after the AIRAVE was finished with its lengthy boot-up process. We walked around to various nooks and crannies and never saw the bars dip below 3. Remember folks, this is all happening in a house that never saw 3 bars of Sprint service prior to the AIRAVE being powered on. Upon dialing our first test subject, we heard a brief double beep just before the ringing began to let us know that the call was being funneled through the AIRAVE. Really interesting story about wikipedia. When it comes to wikipedia, there are two camps of educators - those that think it's a great source of information and a great resource for students and faculty. I'm squarely in that camp, pointing to studies favorably comparing wikipedia to traditional encyclopedias, but also quickly pointing out that there are right ways and wrongs ways to use wikipedia - just like any other source. The other camp includes educators that abhor wikipeda and ban it from their classroom. There we are, back to that knee-jerk reaction to technology - not unlike banning cell phones, and ipods. What's interesting about this wikipedia story is that the culprit is not just any run-of-the-mill student, but instead one of the two men - John McCain - vying to be leader of the free world. The claim here is that McCain - yes I know McCain wouldn't know wikipedia if he tripped over it, so let's say one of his staffers or speech writers used information from the wikipedia entry on the country Georgia to write portions of a recent McCain speech regarding the Russia-Georgia conflict. It's one thing for a student in a freshman English class to use wikipedia as a primary source; a presidential candidate - not so sure. Someone in the comments of the story questioned whether it is possible to plagiarize facts. Unfortunately, this comment assumes the veracity of the facts in the wikipedia entry - which I can't verify without more research. I'm not sure about what's really going on here, but it's fascinating to watch the intersection of politics and web 2.0. CQ Politics | Political Insider - Did McCain Plagiarize His Speech on the Georgia Crisis? Back to School: Time to Take a Look at your Slides? Here's a great Slideshare slide deck from Garr Reynolds at presentationzen. In addition to providing some really instructive before and after slides, I think anyone will be inspired by just exploring random slides in the set. Please take some time this summer to take a look at your slides and start to re-invent your presentation style. Gordon Snyder and I led a half-day workshop Tuesday July 29th on the educational uses of Web 2.0. Here are the links we referenced in that presentation, with some updated information. We may turn this into a wiki and allow people to post tools they've found and used and comment on the list of tools. We may also record this as a podcast. Let us know what you think and what you'd like to see. Just added - Game Builders - not really Web 2.0, but worth looking at if you're interested in educational applications of gaming. Mead Goes Green, with Mind Mapping. 1000 Invites for Mashable. FriendFeed crawls Twitter, Flickr, and YouTube so you don't have to. Interesting story from Scientific American that describes a process, developed by a company called Calera, for taking most of the carbon dioxide (CO2) generated from a 1,000 Megawatt power plant and using it to make concrete. This idea of sequestering pollutants is not new, but this process puts a new spin on the idea by creating a useful product. This sort of approach could have considerable impact, when you consider that China and the US together use nearly 1,000 metric tons of Portland cement per year - potentially netting 500 metric tons of captured CO2. Cement from CO2: A Concrete Cure for Global Warming? "For every ton of cement we make, we are sequestering half a ton of CO2," says crystallographer Brent Constantz, founder of Calera. "We probably have the best carbon capture and storage technique there is by a long shot." Carbon capture and storage has been identified by experts ranging from the U.N.'s Intergovernmental Panel on Climate Change to the leaders of the world's eight richest nations (G8) as crucial to the fight against climate change. The idea is to capture the CO2 and other greenhouse gases produced when burning fossil fuels, such as coal or natural gas, and then permanently store it, such as in deep-sea basalt formations. Clean energy: Do we need an Apollo project for energy? Micro-blogging is a relatively new form of social networking that involves building a community of "friends" - people you follow and people who follow you - followers. Users in the community post "updates" describing what they're doing, links to interesting an website, photos, philosophical musings, etc. An interesting application of these tools is asking the community a question - a version of James Surowiecki's Wisdom of the Crowds approach. 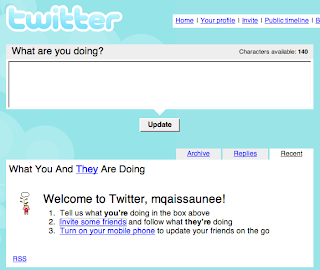 Twitter, Plurk, Jaiku, and Pownce are among micro-blogging applications available. Twitter by far seems to have grabbed the largest user base and is the leader of the pack - although server issues and downtime periodally frustrate users. While many of us may not "get" Twitter and it's 140 character updates, micro-blogging seems to be making it's way into the enterprise. Here's a brief video describing just such an enterprise tool. Are Your Friends in Your Suitcase? I was never an AOL user or subscriber, but was aware of their size and reach in the early days of the Internet. Unfortunately - at least for AOL - with the explosion in high speed data access, and the proliferation of search and content (news, video, blogs and more), AOL hasn't been able to keep pace. Probably their only remaining strong property is AOL Instant Messenger (AIM) and its' large user-base. According to a statement by Time Warner, AOL will be split into two separate businesses: advertising and access. Overall, revenues from its AOL division declined 16% to $1.1 billion last year. Most importantly, subscription revenue from its dial-up services dropped by 29%, especially after AOL started to offer more of its products for free. The only bright spot for AOL was that its advertising sales grew by 2%. Even there, though, the decline in users on sites in the AOL network put a dent into the otherwise relatively positive results. I gave a presentation last week that included ways that educators could leverage the presence of cell phones in the classroom - integrate them into the educational process - rather than simply banning them or having students turn them off. Here's a link to a blog post I used to lead the presentation - where you can find links to relevant resources, under the Cell Phones heading. From today's New York Times, here's another great example of using the technology to improve how an organization operates - it comes from the NYC Police Department. As you would expect, one of the biggest challenges any police department faces is getting citizens to report crimes. Capitalizing on the growing number of young people that use cell phones primarily for texting - rarely making calls - the NYCPD has put in place, and begun publicizing a system to allow anonymous texting of crime reports. Users can even initiate a text conversation with detectives from the CrimeStoppers bureau. It will be interesting to see what impact this new initiative has on crime. The gap between this group of young people - digital natives - and "older" people like myself - digital immigrants - is further highlighted by the phrase "callers must text the word" in the passage below. If they're texting, they're not callers! Now for the million dollar question! How are you and your institution leveraging the power of cell phones to reach and engage this generation? For years, mayors, police commissioners, community leaders and others have sought to drill into the heads of New Yorkers a simple toll-free phone number do dial to anonymously help in solving crimes: 1-800-577-TIPS. Now, they want to enlist a younger generation of crime-busters. On Tuesday, the Police Department publicized directions for citizens on how to send text messages to the authorities, to provide the same sort of anonymous tips for investigators working on unsolved criminal cases. The directions are simple, according to Paul J. Browne, the Police Department’s chief spokesman. To initiate a conversation with detectives in the CrimeStoppers bureau, callers must text the word CRIMES (or 274637 on a cellular phone). Then, to initiate an exchange of messages, and to ensure that identities are protected, a caller must begin the message with the phrase TIP577. The caller will get a response from the police assigning an alias or a code name, which will probably be a combination of letters and numbers. “You can text back and forth and stop it any time,” Mr. Browne said. To stop it, a caller simply types the word STOP in the message field and send it as a text message, “and no more police responses will appear on the cellphone,” Mr. Browne said. Only a year after taking control of Sony's robotics business, Toyota has come up with a vertical, mechanized scooter (or personal transporter, in future-speak) intended to help people move about in public areas. 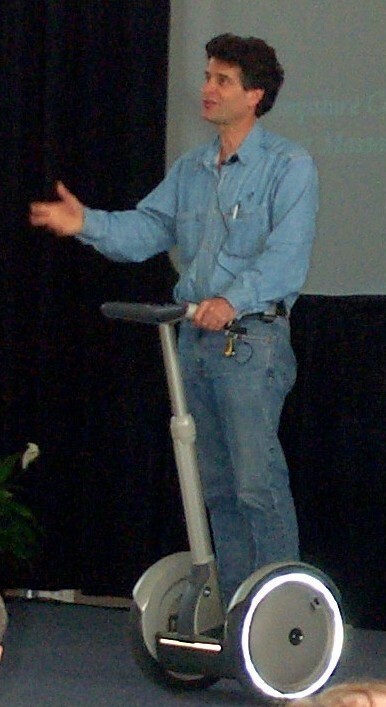 Called the Winglet because of its fleet nature, it is the first gadget to duplicate the celebrated, and often mocked, navigation system of Dean Kamen's Segway Transporter: self-balancing through gyroscopic sensors detecting the gentle directional tilts of a rider. Can Toyota's Winglet become a Segway killer? In a daring bid to wrench attention from his Democratic rival in the 2008 presidential race, Sen. John McCain (R-Ariz.) today embarked on an historic first-ever visit to the Internet. Given that the Arizona Republican had never logged onto the Internet before, advisors acknowledged that his first visit to the World Wide Web was fraught with risk. But with his Democratic rival Barack Obama making headlines with his tour of the Middle East and Europe, the McCain campaign felt that they needed to "come up with something equally bold for John to do," according to one advisor. McCain aides said that the senator's journey to the Internet will span five days and will take him to such far-flung sites as Amazon.com, eBay and Facebook.